mmsonline.com September 2017 MMS 83 FEATURE routines. The sof tware is designed to ensure consistent cutting conditions by defining these 2D and 3D tool paths by more than just area boundaries—for example, maintaining a constant chip load by adjusting parameters in real time. Beyond prolonging tool life, Dynamic Milling enables using more of the flute without worr y about burying the tool, minimizes heat buildup and improves chip evacuation. Even seemingly basic practices like indicating parts with on-machine probes rather than manu- ally, or keeping postprocessors updated to avoid inefficient motion, have become more impactful with a greater variety of lower-volume work. Across the board, technology and strategies that once merely improved competitiveness are now con- sidered nothing less than essential. TRAFFIC CONTROL As for dealing with the small quantities associated with prototype jobs, "the biggest thing is plan- ning," Mr. Ickler says, "keeping the programming ahead of the machines." Strategies to that end include the following: • Standardizing the process. 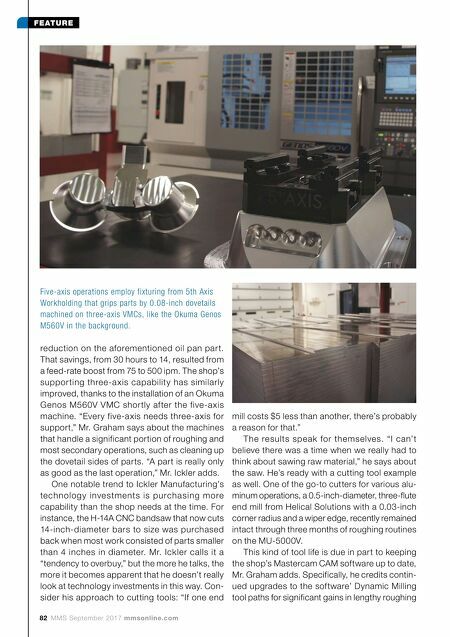 For a shop focused on milling, perhaps the best example of standardization is the tool list. Identical cutters in identical toolchanger slots from machine to machine ensures programmers have everything they need and helps avoid confusion. "We've created a baseline of tools that we know will work in most scenarios," Mr. Graham says. "We don't want hundreds of choices. We want to know what we have, and how to use it in different situations." This also economizes the cutting tool inven- tory, a benefit for shops like Ickler Manufactur- ing that often use special cutters for more com- plex par ts. In one recent example, an Indycar part required 60 individual tools during a series of simultaneous five-a xis contouring and 3+2 milling and drilling routines. Tools are far from the only focus of standard- ization. The shop also has standards for param- eters like cusp height (0.0 0 01 inch for most f in is h in g). B l a n ks c o m e sta n d a rd in 12-fo ot le ngths, a nd all re ce ive the s a me 0.0 8-inch dovetails, which are gripped in the same fixtures whenever possible. Overall, the idea is to make not just a quality part, but an Ickler Manufactur- ing part, he says. • Defining everything virtually. The CAM sof tware tool librar y stores information about more than the cutting tools themselves. Entries also account for specific stick-out lengths from specific holders. Even beyond the tool librar y, modelling every component that might play into a setup, even down to the last vise bolt, has proven critical to streamlining the programming process. "We can import things easily from machine to machine," Mr. Graham says. "You might program a roughing routine in just a few minutes because ever y thing's there—the fix ture, the riser, the toolholder. Sometimes you just re-associate the tool paths." • Building lessons into the process. 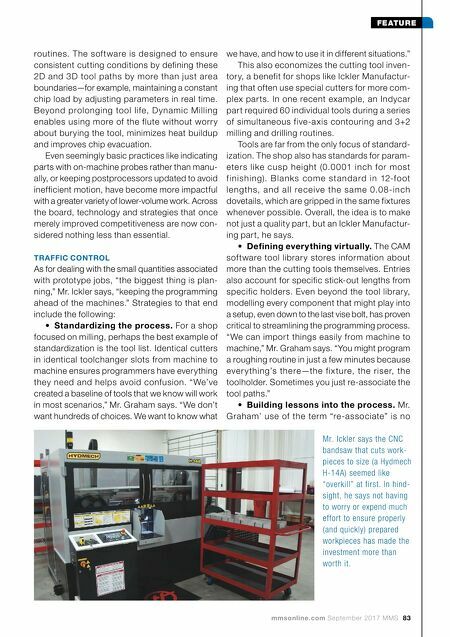 Mr. Graham' use of the term "re-associate" is no Mr. Ickler says the CNC bandsaw that cuts work- pieces to size (a Hydmech H-14A) seemed like "overkill" at first. In hind- sight, he says not having to worry or expend much effort to ensure properly (and quickly) prepared workpieces has made the investment more than worth it.